From the makers of the Wellness Briefs comes the Wellness Absorbent Underwear (Adult Pull Ups). Using the same NASA inspired multilayer core to keep you completely dry the entire time you wear the product. The revolutionary system based approach of 1 change every 8 hours and 3 changes a day now meets the convenience of an adult pull up. A revolutionary new way to manage incontinence. These pull-ons are so innovative that they were featured on Discovery Channel's How stuff works and are designed to last 8-12 hours using NASA inspired multi layered InconTek® technology similar to designs used by astronauts in space for long missions. It has a unique scheduled changing system and is therefore is one of the easiest to use. This is revolutionary because changes can actually be scheduled to only once in eight hours/ three in 24 hours putting the wearer or caregiver in control with no worry of any exposure to the effects of urine. 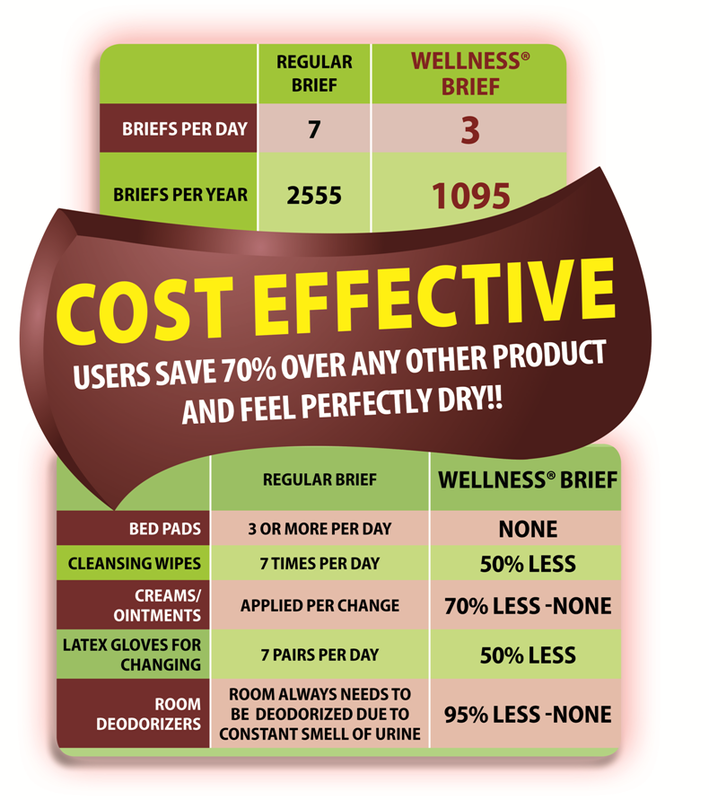 More cost effective than other absorbent underwear because of fewer changes and rarely requires expensive creams or ointments. The Blue stripe in the waist goes in the front, making it easy to put on correctly. Important Note: This product is a pull up style product designed to last 8 hours for people who have light to moderate Incontinence. If for any reason this product does not meet your absorbency needs we suggest you consider our side taped Superio Series Brief (side taped diaper) Click Here. Many use our Absorbent Underwear by day, but the Superio Series Brief at night if extra protection is needed. We're so convinced that you will love this product that we want you to try it for free! Returns accepted within 30 days of purchase of unused items in their original, sealed internal packaging, in re-saleable condition. This product is not returnable if opened, unless defective. Does An Excellent Job ! They are very comfortable to wear and allow you a good night's sleep. They are not bulky ; I have worn them (if necessary)under day-time pants and they do not show.